I just spent the weekend working The Barclays golf tournament with my fellow South Plainfield CERT and RACES members. Over the past week, I have put in about 20 hours worth of volunteer time on the streets adjacent to the golf course. No earth shattering EMCOMM work, just public safety stuff. The main job was to insure that the spectators walking into and out of the event didn't get run over by one of the many shuttle buses coming in and out of the event entrance. There are Ham / CERT people that I know that have a real disdain for this type of thing. I've heard comments such as that they'd "never be caught being a human traffic cone", or that they refuse to participate in an event where all they are doing is directing traffic or directing cars to parking spots. They hate this type of stuff so much that they refuse to show up for such assignments. I can see their point, as they feel that these type of jobs are trivial and meaningless. But I think they're missing a much bigger picture. 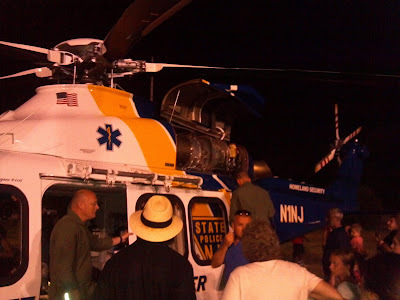 Yes, working public safety events such as The Barclays, or civic events like a parade or a 5K race or whatever may not be like helping out after an earthquake or hurricane. But they do serve a purpose of more than just being a "human traffic cone" or some such thing. Events such as these give you the chance to become familiar with and bond with (if you will) the other members of your team. Once you've been through an event like one of these, which are relatively low risk, you feel much better about being with those same people during a high risk emergency. You get to know who in your group is the leader type, who's the procedures expert, who might be the logistics expert, etc. While we're all called upon to perform all types of functions, some folks are just better at certain things. Do enough of these events, and you'll know who to place where when the real emergencies come up. You get a chance to keep testing your equipment. You also get the chance to keep "weeding" out your Go Bag or Go Kit. You find out what's important, what's a "must have" and what might have been initially included that you can do without. For instance, when we were issued our CERT kits, I found that the issued flashlight, while good for general purposes wasn't all that helpful in public safety events. I purchased a tactical flashlight with a bright LED light that will blink rapidly. That really catches the eye at night when you're trying to direct traffic, whether that be at a fair or perhaps in a disaster area. My HF and VHF Go bags are always being evaluated and re-evaluated after each event we serve for "what works, what doesn't". Items I thought would be important turn out to be not so, and sometimes something I thought would be superfluous becomes a "can't do without". You also get the chance to meet and become familiar with the people you will serve with and under. It's not a far stretch to think that the police officer you became friendly with at your town's 4th of July parade may be the same officer you might be working with on a missing person search some day. 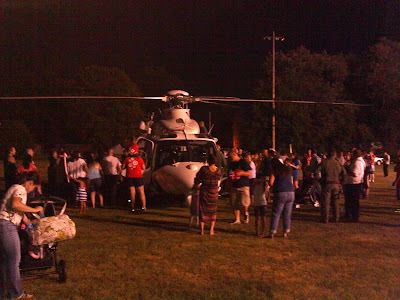 Or perhaps the EMT you met at your town's fireworks display may one day be the same person you'll be partnered with to evacuate people from a flood zone during a hurricane. You never know. So I would advise me fellow Hams and CERT members not to scoff at serving at community events and the like. Yes, they're not the bona fide emergencies that you signed on to serve at, but they are important in their own way. Use these opportunities to your advantage, along with your formal training, they can and will get you ready for the "Big One". Oh, and this video is for all of those out there who would tell you that Amateur Radio is ancient, obsolete and of no value. Sadly, there are Hams as well as paid professionals out there who think that our communications infrastructure can never fully go down and that Amateurs who believe that they provide a necessary backbone service are just pipe dreamers. Let them watch this and then see if they still believe that. Yeah, it's a few years old, but it's as germane and valid now as it was back then. One final thought to those of you who would like to volunteer and be put in a situation where your help is vitally needed. Get some training! Yes, in a dire emergency, every able and willing body will be put to use. However, if you get some formal training in Emergency Communications as well as in dealing with emergency situations (CERT for example), your stock and value go up, exponentially. I went out to the car at lunchtime to try and get some QRP in. There were no signals on any of the bands that I was able to hear. And this wasn't just a problem this afternoon, as this has been going on for a while. Last night, I turned on the radio in order to get ready for the 20 Meter QRP Fox hunt. With 10 minutes to go before the hunt started, I twiddled the dial between 14.050 and 14.070 MHz. I was not able to hear a single, solitary CW signal. No QRPers, no FISTS, no SKCCers - no one. I consider it a minor miracle that an hour into the hunt, I was able to discern NK6A's signal coming out of California and work him to earn a pelt. It seems that right after the Skeeter Hunt, we have spiraled into a period of solar activity that's been wiping out the HF bands. Periods of favorable conditions have been sporadic and far and few between. I sure hope that with the coming of the Autumnal Equinox that conditions will improve. 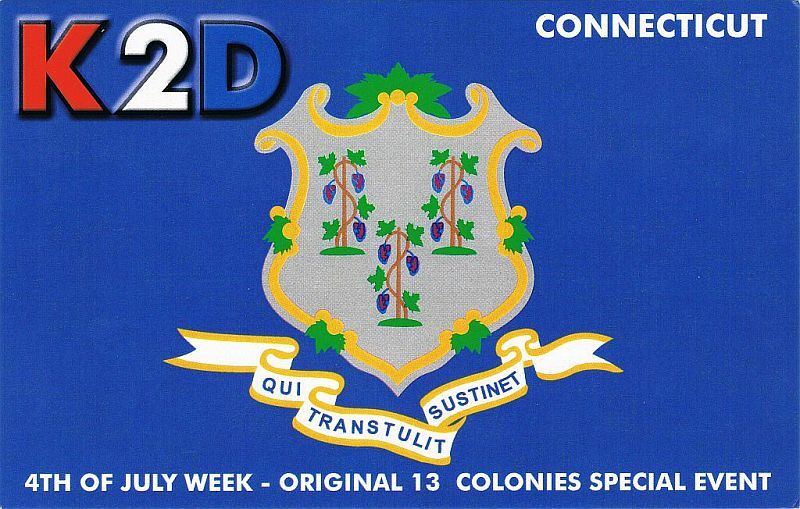 13 Colonies Update - I got the Connecticut QSL card two days ago. I'm waiting on the last card to complete the set - of course, it's New Jersey. Nasty OT Ham - Reality or Myth? Every now and then I wander over to eHam. net. And sometimes I wonder why I bother to wander. It's not uncommon for me to read the articles, and then inevitably, come across some comment by a self-proclaimed "newbie" wherein he or she begins to bemoan the treatment they've received from some "old fart", nasty, mean ol' Ham. "I'm new, bright-eyed, bushy tailed, full of exuberance and spit and vinegar - but yet somewhat lacking in knowledge and experience. I've gone to WB#XYZ repeater or to the Amateur Radio Club of Greater Podunk, where my inquiries were met with laughter, ridicule, sarcasm and down right meanness from Joe Ham. I am now going to sell all my Amateur Radio equipment because I'm traumatized and I never even want to hear the words "Amateur Radio" again." I've seen this retold several times, in several different instances. I hate to question the veracity of the people making these claims - but can they be true? This has become a pet peeve of mine. I've mentioned many times now, that I've been licensed for over 35 years. In all that time, I have never, ever, not even once come across treatment like that from an older Ham. Don't get me wrong, I've had to withstand my share of newbie ribbing, and have received my share of friendly and gentle reprimanding when doing something wrong - but nothing like these guys are describing. A case in point. Shortly after upgrading to General in 1979, I joined the Old Bridge Amateur Radio Association. 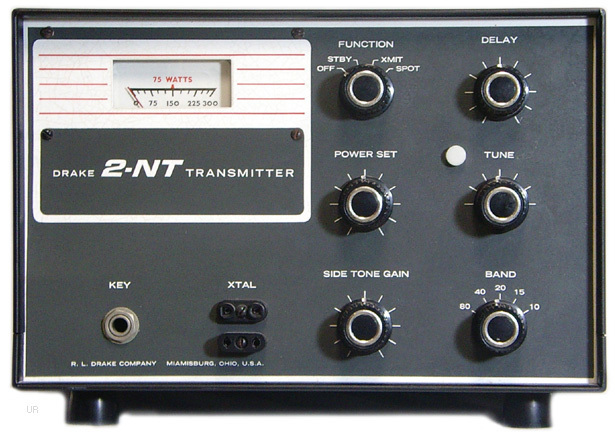 They owned and operated the KB2TX repeater at the time (well actually, it became the KB2TX repeater after Walt, the owner, changed his callsign to KB2TX - I forget what it was before that). Anyway, I had installed a used non-Icom microphone with a DTMF pad on my Icom 2 Meter mobile, so that I could make phone patches if the need came up. Back in those days, (am I dating myself?) it was rare for a mobile microphone to come with a keypad pre-installed. Unbeknownst to me, the microphone's element wasn't working. The DTMF tones were making it through, but my voice wasn't. So Walt got on the air and in his usual gruff and no-nosense manner announced, "Hey! Whoever's sending the tones - you've got no audio. Stop it and identify yourself". I was saying "KA2DOH (my call at the time) testing. ", but it wasn't coming through. I had Walt's phone number and gave him a call, explaining the problem. After listening to my profuse apology, he got quiet and thought for a few seconds. Instead of giving me a tongue lashing, as technically I was breaking the rules, he suggested that the impedance of the microphone element might not be the proper valuthat the rig was looking for - a mismatch. Sure enough, that's what it turned out to be. I listened and I learned something (that had never occurred to me) and was able to remedy the situation by going to Radio Shack, where I purchased and soldered into my microphone an element with the proper impedance. Walt could have dressed me down, and read me the riot act, but he didn't. He was that way to everybody. In fact, in dealing with all the Old Timers throughout my Amateur Radio career (there were many) - they were all like that. I can't ever remember a time where I received a snotty, snarky or sarcastic reply to a question. In fact, in my dealing with experienced Hams, they have always been helpful, accommodating and educational. And I live in New Jersey, too - supposedly the home of unfriendly, sarcastic, snarky and just plain mean ol' human beings in general! So where does this curmudgeon live? DOES this curmudgeon live? Or have we become so hyper-sensitive to any kind of criticism that even helpful criticism is taken as an incidence of ego-shattering reprimand? Maybe they do exist, and maybe I'm lucky that I've never come across one. Maybe I just need to go down on bended knee and be grateful that I've never run across the "No kids, no lids, no space cadets" type of Ham. I can tell you that I have become dear friends with several "Old Timer" Hams who did have very rough and gruff reputations, only to find out after spending some time talking with and listening to them, that they had hearts of pure gold. Sometimes that's all it takes, just listening for a bit instead of always chattering and insisting that we know everything, and that we're always right - when maybe, just perhaps, we're not. Peanut Power Sprint - September 27th. The Bees have swarmed and the Skeeters have been hunted. Now it time for a snack - The Peanut Power Sprint! Everyone plays... Outdoors, indoors, lo/hi power, ... there is even a QRO category. 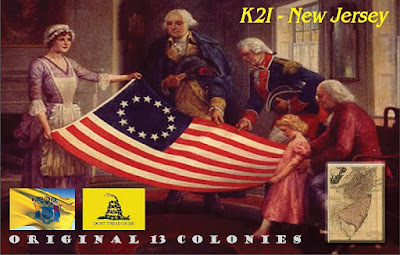 Sponsored by the North Georgia QRP Club (NoGaQrP), this sprint will be held on Sept. 27, 2015 from 4PM to 6PM EDT (Sept. 27 - 2000z to 2200z). Full rules are on the NoGaQrP website - nogaqrp.org Your QSO will be worth more if you have a PEANUT number; assigned NEW each year (see below). The club is making this one different from most other QRP QSO events. 1. It is open to all amateurs at any power level. This is to attract some new folks to QRP while running their comfortable power - QRO (<100 watts pls) All are welcome and there is a QRO category. This is a FUN event. Not cut-throat! 5. Plaques will be awarded for each of 5 category winners (minimum 3 entries). 6. Sprint encourages SSB as well as CW contacts. The exchange: RS(T), State/Province/Country(SPC) and your Peanut Number or Power. 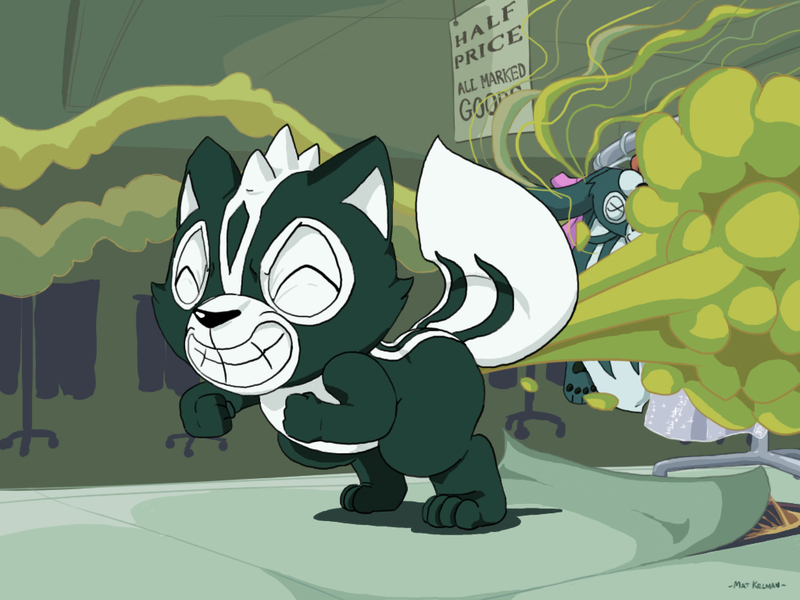 Call CQ NUT and have FUN! 8. This will encourage activity on the 3 permitted bands - 40, 20, and 15M. There are suggested frequencies for each band/mode. Notice we are encouraging the now almost dead portion of 40M - 7061 khz and up. 10. Work stations holding a Peanut Power Number (PPN) for 7 points. Stations worked who do not hold a PPN (will send their power) yield 3 points. Yes, QRO stations can request and receive a PPN. You do not declare your category until you decide to send in your entry. If you get halfway through and change your power, simply enter under a different category than you originally thought! Include the word PEANUT POWER NUMBER in the title of your request please. This is a really fun Sprint/Operating Event. If you have EVER been intimidated by QRP Contesting, this is the contest for you! I'd like to make a special request to all the Skeeters to please buzz on over to the NoGA site and request to become a peanut for an afternoon. I guarantee you will have a blast! FCC website maintenance in early September will make the Universal Licensing System (ULS), the Electronic Comment Filing System (ECFS), the Electronic Document Management System (EDOCS) and other public applications unavailable for more than 5 days. 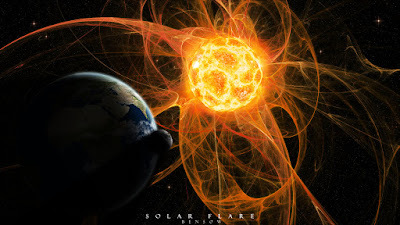 The Commission said the outage will begin at 2200 UTC on Wednesday, September 2, and continue through the Labor Day weekend. The maintenance work should be completed by 1200 UTC on Tuesday, September 8. During the ULS outage, it will not be possible to file any Amateur Radio applications. The FCC will extend filing deadlines for all regulatory and enforcement filings that fall during the maintenance period. Filings due on September 2, 3, 4, or 8 now will be due on Wednesday, September 9. "Except for the due dates specified herein, we are not automatically extending the deadlines for any other comment or filing periods that will be running during this time period, but requests for extension of time will be considered consistent with the Commission's normal practice," the FCC Public Notice said. "To the extent the due dates for filings to which reply or responsive pleadings are allowed are affected by this Public Notice, the due dates for reply or responsive pleadings shall be extended by the same number of days." In a blog, "Modernizing the FCC's IT," FCC CIO David Bray said that with the world and the technology we use are changing rapidly, "the information technology used by the Federal Communications Commission must change as well." Bray said the FCC has "made significant progress to upgrade and modernize our infrastructure, and we continue to work on modernizing the FCC's legacy IT systems with the resources we have available." "We understand that this temporary downtime before and during the Labor Day Weekend may be inconvenient for some FCC stakeholders," Bray added. OK - I've made the 2015 NJQRP Skeeter Hunt Scoreboard public, the results are as posted. We didn't do too badly this year. 170 Hams signed up for Skeeter numbers (a record) and we had 60 log summaries submitted. That's about a 35% return rate. As promised, the soapbox page will come shortly and I will announce when it's ready for viewing. Most nights this week will be busy as I will be volunteering with my CERT team for crowd control duties, as the Barclay Golf Tournament is being played out at the Plainfield Country Club, which is about 1/4 mile from my house. Look for the soapbox announcement some time next week. Thank you to all of you who sign up and those who participate, and those who help me get the word out about the NJQRP Skeeter Hunt. I'm already looking forward to 2016's event! And as always, if any of you have any suggestions as to how this event can be improved, I'm always willing to listen. Changes were made this year due to someone's input from last year and there was a good suggestion made to me after this year's event which will result in a small change in the way QSO points are calculated next year. I'm all ears, guys! I know I promised the 2015 NJQRP Skeeter Hunt Scoreboard would be published today, so my recounting of my busy weekend isn't an excuse for not doing that. Actually the spreadsheet has all been compiled and is up on Google sheets, but is being held private for the moment. I got an e-mail yesterday from Randy KB4QQJ. He had submitted his results last week and did not receive the confirming e-mail from me ...... and that would be because I never received them. So I asked him to re-send ASAP and I will post the link later today or tonight, either way. If I have to change things around due to his entry after the initial posting, I will - but something will definitely appear at some point later today. From his brief e-mail to me, I don't think his entry will affect the top five finishers. The weekend was busy chore-wise. And normally, I wouldn't consider that such a great thing. The HF bands have been so crappy, though, that at least I've been too busy to bang my head against that ionospheric brick wall. The few times I did turn the KX3 on for a few minutes, I thought both my antennas had disappeared, with one exception I will talk about later. I spent Saturday mowing the lawns, front & back, as well as completing all the trimming in the backyard. It's kind of amazing how much lawn I've reclaimed by beating off and cutting back all my neighbors' flora overhang from my two side fences. Not only does the backyard look bigger now, but mowing the lawn will be easier. Each time I got near the fence on each side of the yard, I was being treated to whaps in the face by low hanging bush branches encroaching from their yards. Not a problem now! On Sunday, I had the great honor and immense pleasure to be interviewed by Eric Guth 4Z1UG for an upcoming installment of his "QSO Today" podcast. I have no idea when it will actually be released, but someday soon you'll be able to hear my voice and you'll suddenly realize why I've stayed a CW guy all these years! All kidding aside, it was a fantastic experience. Eric is a warm and friendly person who immediately puts you at ease. It was just like having a QSO with a dear, old friend. The interview lasted for close to an hour, but it felt more like five minutes. Eric has done a lot of really cool podcast interviews with a lot of deserving and interesting Amateur radio ops, so why he selected me is anyone's guess. But you should do yourself a favor and follow the link I provided and listen to some of them. He's performing a great service to the Amateur Radio community by providing fascinating conversations for us to listen to. This series kind of reminds me of the old Edward R. Murrow "Person to Person" TV show, but on an Amateur Radio basis. After I finished up with Eric, I dove into cleaning up the shack. I'm not proud to admit that over the past few months, it became a dumping ground and a pig sty (however, I am Flying Pig #612, so maybe that's appropriate?). I ended up spending about three hours, cleaning, organizing and pitching "stuff". I ended up filling four of those large 30 gallon green trash bags with stuff I should have tossed a long time ago, but never did. As a bonus, I "found" a few items that I have been looking for and had misplaced. For instance, last Winter, I had ordered a few kite winders that I wanted to use for storing the radiator wires for my EFHW antennas. As QRPTTF and FOBB approached, I knew I had them, but I couldn't locate them. I had put them down in the shack, and just couldn't figure out where - exactly. I found them yesterday and they are now safely in my portable ops backpack. 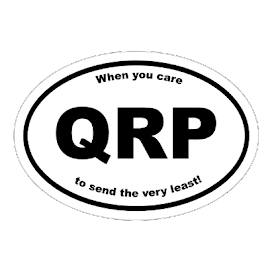 Of course, it's as we approach the end of the outdoor QRP contest season - but I have them. Yay! I actually have room to move around and breath in there now! Don't get me wrong .... it's by no means an immaculate shack. I still need to dust and I want to re-hang my DXCC, WPX and QRP-ARCI awards on the main shack wall before I will consider the job done. However, I can now bring a visitor into the shack without fear that they'll be swallowed up like one of those hoarders you see on TV. I finished up the evening, by returning to the shack after dinner to see how 80 Meters was behaving itself. It sounded relatively quiet, so I guess that's another depressing sign that Autumn is on the way. (My regular readers know that I'm a Spring/Summer kind of guy and that Autumn bums me out because I know that Winter is not far behind.) I plunked down around 3.561 MHz and tried calling CQ for a bit. For my efforts (no real big effort!) I was rewarded with a QSO from Lee K4ISW in Chartlottesville, VA. Lee just recently acquired a K3S and I was one of his first week's worth of QSOs on the new rig. Lee's K3S sounded great and Lee sounded happy - so I'm thinking a win/win situation is occurring at the K4ISW shack. 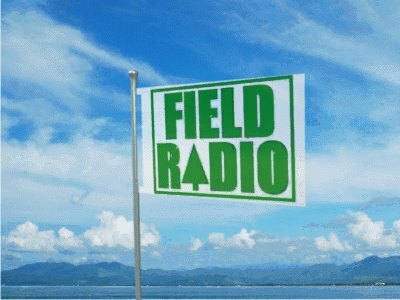 80 Meters sounded great after a Spring and Summer filled with static crashes and loud background QRN. The return of 80 and 160 Meters into useful Amateur Radio bands is the ONLY good thing about Fall and Winter, in yours truly's humble opinion. 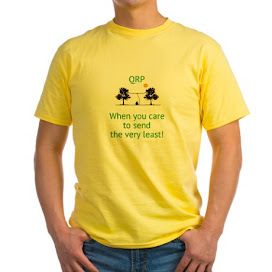 Take care guys/gals - QRP and CW on! 4 State QRP Group is at it again! We are pleased to release for sale new runs of K8IQY's SS40HT receiver and SS40Tx companion transmitter. A combo may also be purchased at either web page, look near the bottom of the Paypal button menu. We have limited quantities of each in this run, so order soon if interested. 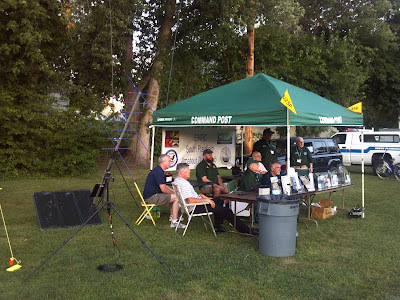 As always thank you for supporting the Four State QRP Group and OzarkCon. The 4 State QRP Group offers great kits and purchasing them helps fund Ozarkcon. It's a win-win! I still need these two QSL cards to complete the 13 Colonies special event for 2015. 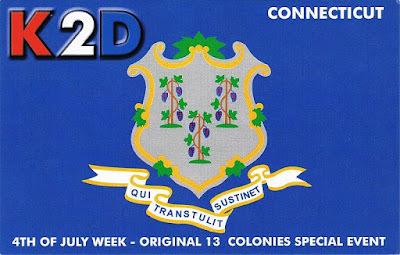 Of course, it's kind of ironic that one of the two QSL cards that I need would be from the state that I live in - and that my original QSL request was sent to a town just two over from home. 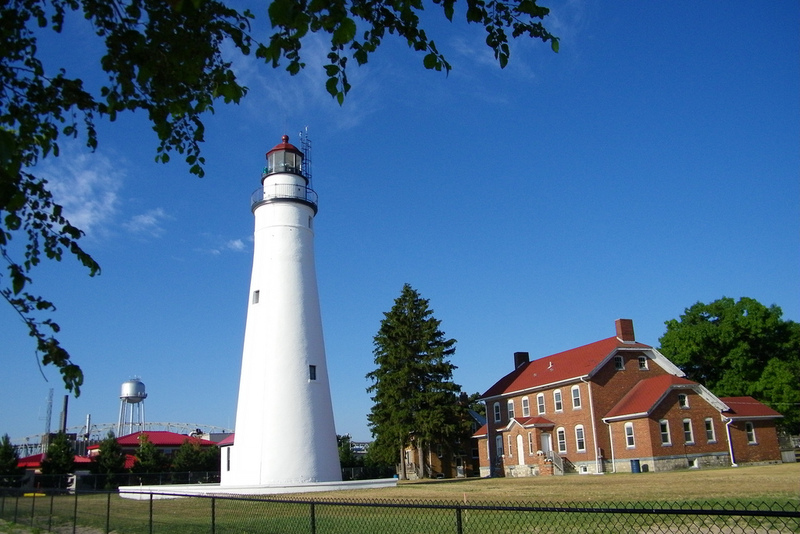 I guess I will have to re-send QSL requests to both New Jersey and Delaware. However, instead of mailing the NJ one, I might just drop it off at the manager's mail box. He lives not far off the route I take to get back and forth from work every day. That way I'd be 1000% sure that he received it. Yes, this is a Heathkit DX-60 and the accompanying HG-10 VFO. Well actually, he picked up the DX-60 at the hamfest. A friend supplied the HG-10 and advised Bob that it needed some TLC, and that if he could get it working, that he could purchase it at a super reasonable price. 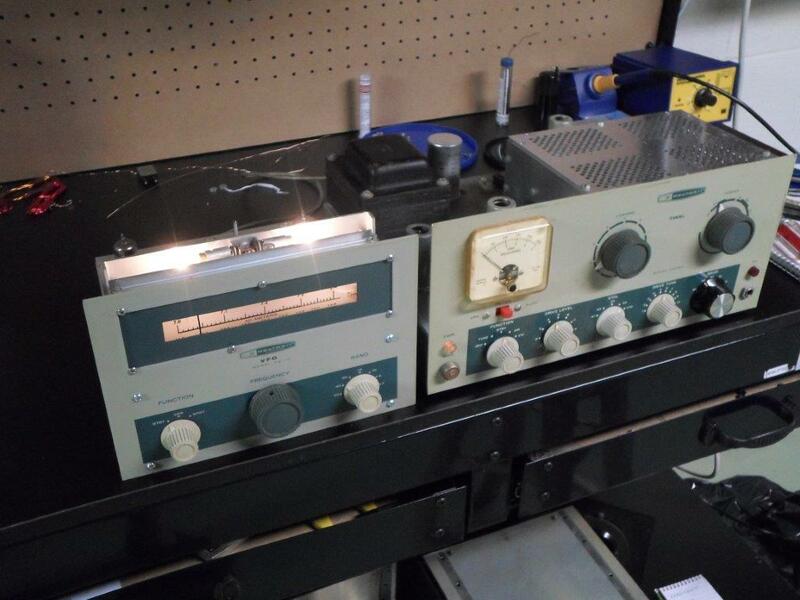 Bob has succeeded in getting it to work and he e-mailed me this morning that he is in the process of homebrewing a cable to get the output of the VFO into the DX-60. That reminded me of a much earlier time, when I had these in my Novice station. 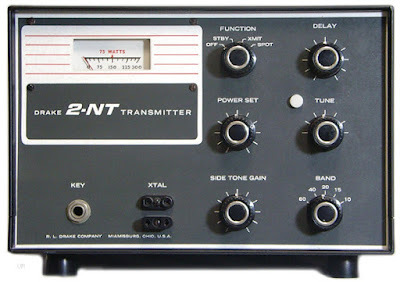 My Novice transmitter was a Drake 2-NT that I had purchased through Burghardt Electronics. 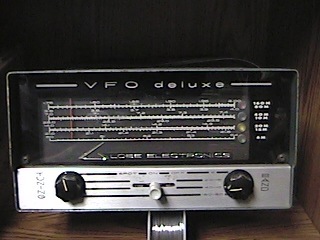 I had purchased the Globe V-10 VFO from John Kakstys W2FNT who lived in Linden, NJ which was not too terribly far from East Brunswick, where I was living at the time. 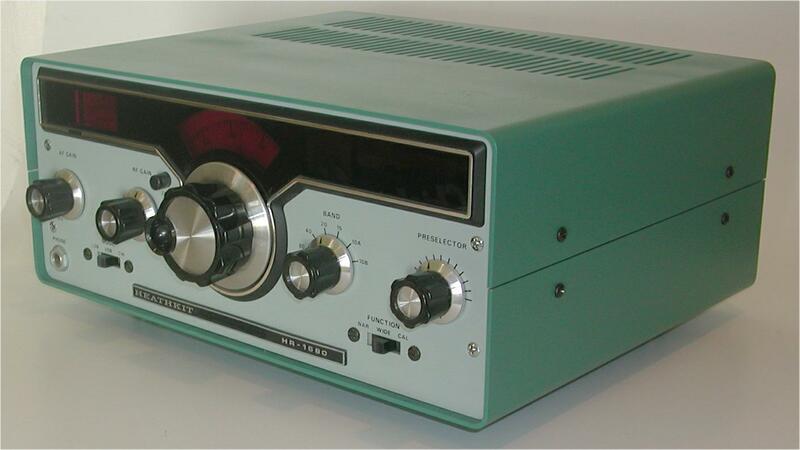 My receiver was the Heathkit HR-1680, which was my very first Heathkit build. That it worked without a hitch the very first time, upon firing it up, still amazes me to this day. Anyway, I had the transmitter and I had the VFO. What do I do with them? That was the quandary for me at the time. This was 1979, after all. There was no Internet, no Google. I had no Elmer with whom I could speak, other than the instructor who taught the license class I had attended (and I never got his home telephone number). So it was either get the information I needed from a book, QST or go with my gut and improvise. I improvised. There was a two conductor cable coming from the output of the VFO. The 2-NT's crystal socket had two holes for where you would plug in a crystal. I figured that the output from the VFO had to go there - it just seemed reasonable to me. So I took a junk crystal, pried the bottom part off, which left me with a base and pins. Then I soldered the two wires coming from the VFO output to the crystal base pins. I plugged it in, hoping the 2-NT wouldn't know the difference between a crystal and a VFO. I took a deep breath, muttered a prayer and turned everything on. I half expected it to blow up, taking me along with it, or to somehow electrocute me. 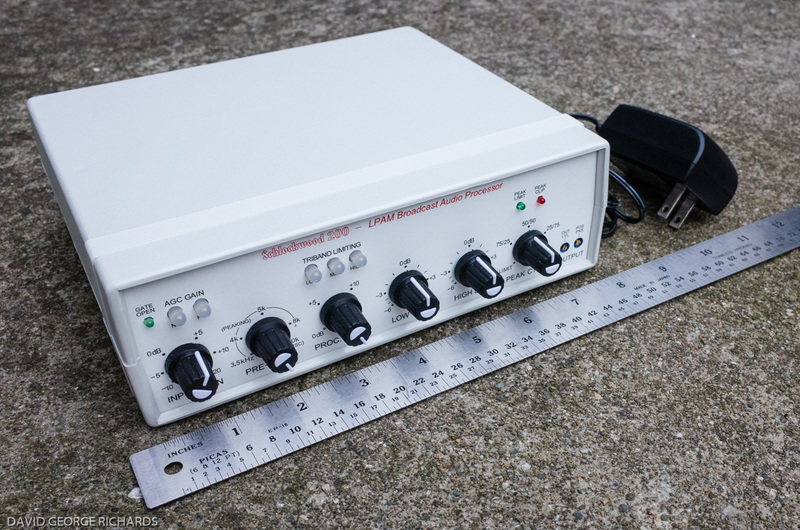 I connected the 2-NT to a dummy load and adjusted it for the lowest output power I could (see, QRP even way back then, I just didn't know it yet!). Then I turned on the HR-1680 and keyed the 2-NT to see if I could hear anything. I had successfully hooked up my VFO to my transmitter and did not harm myself or anyone else in the process. Much to my parent's delight, I didn't burn down the house, either! I used that setup for a lot of QSOs and enjoyed the heck out of it. After I upgraded to General and bought some equipment capable of doing SSB (silly boy), instead of selling off my Novice station, I donated it to the Handi-Hams, who were pretty much a new organization back then. I guess they must have been desperate for equipment donations at the time, as they gratefully accepted it - homebrewed VFO cable patch job and all. They were bad and have been for a while now. I'm lucky that I managed to garner 45 QSOs in the Skeeter Hunt. It seems the bands went right down the tubes right after. 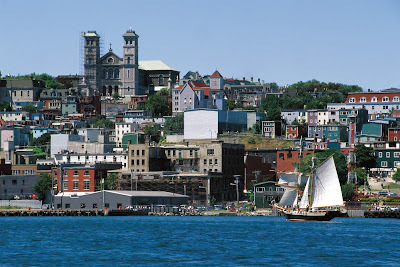 But I did manage to work Gus in Newfoundland VO1/DJ8QP, on 20 Meters. I don't know whether Gus is visiting on business or perhaps, vacation. I would guess the latter - looks like a beautiful place to visit. I wouldn't mind spending some time there myself - but not in the winter, I think! Just sayin' - log summaries are due NO LATER than midnight this coming Sunday evening - when Sunday changes to Monday. That's two full weeks after the event - after the deadline, you'll be out of luck as far as being eligible for certificates, or being listed on the scoreboard. Everyone who has sent in a summary so far should have received a confirming e-mail. If you sent in results, but haven't received an e-mail from me - try again. If anyone out there is thinking of purchasing one - do yourself a favor - save your money and don't. At least for now. 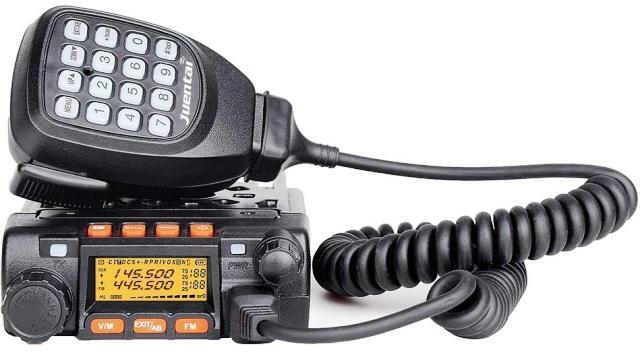 I have rarely, if ever, run across a product in the Amateur Radio market that I would advise others to avoid like the plague. This may be the first. The unit is innocent looking enough and after successfully using both Wouxun and Baofeng radios, it was a reasonable assumption (at least in my mind) that this little unit would be somewhat on par with those. It's not. The JT-6188 is small, compact, and not that hard to program (using a computer). It fits nicely in the car, doesn't use too much power and the audio output coming out of the speaker is loud - robustly loud. Of course, it's controllable with the volume knob. The problem is the receive audio quality. On the dining room table, standing still, it's fine! Once installed and the car start moving? For some reason, it becomes garbled almost to the point of being unintelligible. At first, I thought it was a problem of the transmitting station not making it well into the repeater, but then I noticed even nearby repeaters with strong signals were hard to listen to while the car was moving. Switching out the Juentai with an HT revealed it wasn't an antenna or transmission line problem. As a tiny little base rig - this is not a bad little unit. It has more "oomph" than your standard HT - about 20 Watts out at the High Power setting. As a mobile radio - it stinks, badly. A little "after the purchase" research revealed others reporting the same problem - but interestingly, others not. As always, hindsight is 20/20, and I guess I was blinded by the low price and convenience factor of not having to run power cables through the firewall to the battery. I'm not going to toss it, as I can probably find a use for it someday. But it won't be in the car, and I guess I'll go back to using an HT connected to the external antenna along with a speaker mic. Today was about a 30 - maybe even more. The day started sunny and bright. As soon as I walked outside at 7:00 AM, it was easy to tell it was going to be a hot one. Summer! I love it! I set out one of my 12 Volt SLA batteries on a patio chair in the backyard and hooked up one of my small solar panels to get it charged up. I had used the battery as a power source so I could program the Juentai VHF/UHF radio in the house, as well as to do some test transmissions. At 20 Watts out, I depleted the battery rather quickly, so I took the opportunity to use sunny days both yesterday and today to get it back up to full capacity. I had to go to Home Depot to get some shorter sheet metal screws. The ones that came with the unit were about 3/4" long. I put my hand up and in behind the housing/fairing and could not feel anything vital behind my proposed mounting area, but I still wanted shorter screws. I got some 3/8" ones that did the job magnificently. The unit will sit a few inches from my right knee, but it is completely out of the way and non-interfering with the operation of the car. Not that I use it that much, bit it's great to have VHF/UHF in the car again. Shortly after, I went down the basement shack to see if I could work any lighthouses during International Lighthouse and Lightship Weekend. The bands were terrible! I managed to hear and work one - W8F, the Fort Gratiot lighthouse at Port Huron. Michigan. QSB was terrible, but I gave Stan a 579 and he gave me the same. Then at 1:30 PM, I left to take a short drive over to Dave KD2FSI's house. 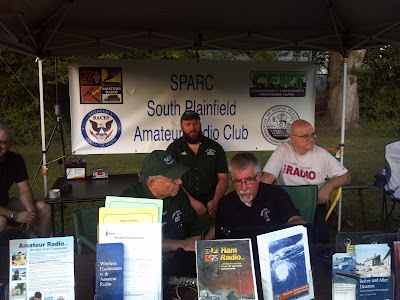 Dave was hosting the South Plainfield Amateur Radio Club's Digital Rookie Roundup effort. He had his two Yaesu's hooked up and raring to go. He also had on display a Heathkit transciever that he recently bought at the Sussex County Amateur Radio Club Hamfest in July. Talk about pristine! Dave "lifted the hood" and let us take a look inside - it looked like it was built yesterday. It is immaculate, and looks like brand spanking new. And on the table next to it was an HW-8. The bands were as terrible at Dave's house as they were at mine (surprise!). There wasn't a lot of Rookie RTTY activity, so Dave graced us with demos of PSK31 and the other digi modes and we had a great time shooting the breeze. Marv K2VHW and Drew W2OU were there in addition to a couple of Dave's neighborhood friends. I think between Dave, Marv, Drew and I, we gave his friends a good enough rundown on Amateur Radio that they could have passed the Tech test had we given it to them! I had to leave at around 3:30 PM as I had promised my son Joey and my wife Marianne that I would accompany them to the community pool this afternoon. They've made use of the pool a lot this summer, and I haven't - so I promised I would go today. As I was leaving Dave's house and saying my good-byes, Dave says to me, "Make sure you don't leave without your radio." All I could do was shoot him a "?????" look. "The HW-8 ..... it's yours." I was speechless. He had said that he had read somewhere (guess where?) 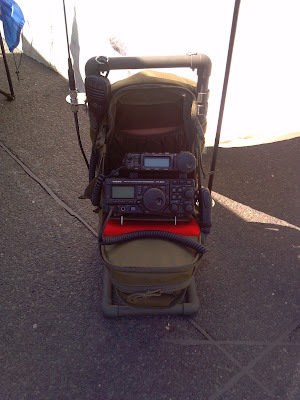 that the HW-8 was my first QRP rig and that I had very much regretted parting with it years back. He had his son scour eBay for a good deal and acquired it for me. I was still speechless. I managed to croak out a "Thanks, Dave - you shouldn't have". But that is soooooooo inadequate. Dave has a heart of gold and as much as that HW-8 means to me, Dave's frienship means even more. I can't ever re-pay his generosity, but that sure doesn't mean that I'm not going to try - somehow, someway, someday. As you can see, the rig is in pristine condition, besides the writing on the power supply, there's not a mark or scratch on it. Whoever had it made one modification that I can tell, they traded out the original RCA connector that was used for the antenna connection with an SO-239 - so that's perfect! This baby is going to get a lot of use. Yes, it's a HW-8, but I now have one back in my hands, and it's also a testament to the generosity of a great Ham and better yet, a great friend. I did go to the pool with Marianne and Joey and even went in the water. I stayed at the shallow 3 foot end as I never learned how to swim as a kid. Even so, Marianne, Joey and I stayed there for about two hours, enjoying the cool water and we played a game of catch with this "Wubba" pool ball (small, soft, floats, unsinkable) that Joey had purchased when we were up at Lake George. The evening was rounded out with a delicious dinner of grilled Teriyaki chicken, baked taters and corn, all consumed while leisurely sitting around the patio table in the back yard. We were able to enjoy the cooler evening air and each other's company. So, yeah, on a scale of 1 to 10, today was about a 30 - heck, maybe even a 50! Using the software from the Miklor website, as well as the drivers for the programming cable, I successfully programmed my Juentai JT-6188 VHF/UHF radio. Even though the software came on a mini - DVD with the cable, the Acer Aspire doesn't have an optical drive. This necessitated downloading the software and drivers. Everything went as smooth as silk. The radio has 199 memory channels and I filled 45 of them. Looking at the instructions, it actually looks like manual programming shouldn't be too difficult, so I should be able to fill additional memory slots as needed, on the fly. I hope to complete the install tomorrow, complete with a new dual band antenna. I actually broke the last one, if you can believe it. I backed into a chain link fence a few months back, and while I didn't dent or damage the Jeep, I did crunch my antenna. Once everything is done, I'll post some photos. I always ask for pictures for the Skeeter Hunt Soapbox. I'm not different from any of my fellow QRPers. I like to see how my peers set up, how they do things and compare it to what I'm doing if possible. That, and plus the fact that it's nice to put a face to the fist of the guys I have worked. So far this year, two Skeeters have gone above and beyond the call of normal duty and have sent me a couple of short videos - so I will embed them here. Thanks guys, for sending these in! I think I'm going to have to ask Santa for a GoPro this Christmas so I can take videos of my QRP exploits, and share them, too. On second thought, maybe it's not such a good idea for you guys to see how I mess up - er, I mean operate. Hi! There were a couple of guys who I worked, who had signed up for Skeeter numbers, but didn't use them this past Sunday. I have a hunch that plans had changed and they were not able to go portable as they had intended. Being portable is NOT a prerequisite for obtaining a Skeeter number. Any station can be Skeeter station. Although the aim of the Skeeter Hunt is to get outdoors, it's not mandatory. Things happen, weather and personal circumstances can change in a heartbeat. Ask me, and I can tell you all about it. Now for something completely different. Before we went on vacation, I saw where Amazon had these on sale. It's one of those Juentai JT-6188 VHF/UHF mobile rigs, and it was under a hundred bucks. It goes up to 20 Watts out and the power cord terminates as a 12 V accessory plug (we used to call them cigarette lighter plugs back in the day), so there's no need to snake wires through the vehicle firewall. At high power, the unit draws a little over 2 Amps and the cigarette lighter circuit is rated for 20 Amps, so I should be good to go. 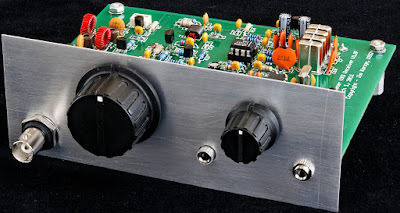 In New Jersey, a 50 Watt unit really is overkill, and this kind of keeps in with the QRP way of thinking, so I am happy. And as I've stated before, VHF/UHF is not my first love, so this will fit my needs perfectly. It arrived a few weeks ago, and I hope to install it in the Jeep this weekend, but I'll have to program it first. The software wouldn't load up on my Windows 7 laptop, so for the heck of it, I dug out my old Acer net book with Windows XP on it. Bingo! Tomorrow evening, I will try to load it up with all the same frequencies that I have in my HTs. Before I close this post - Skeeter Hunt log summaries are due by midnight when Sunday August 23rd turns into Monday August 24th. If you haven't submitted yours, what are you waiting for? (grin). Each submission gets a confirming e-mail from yours truly, so if you've submitted, but didn't hear from me, that means I didn't receive it. Thanks to all of you who participated in the NJQRP Skeeter Hunt! Thank you, thank you, thank you ..... THANK YOU! As usual, I had a blast. There seemed to be a lot of Skeeter activity in amongst the SKCC WES'ers and the WAE'ers. From time to time it felt like you needed a scorecard to figure out who was working what. In all I made 45 QSOs, most of which were Skeeters and I believe I got the word bonus, too. It was fun. And to make matters even better, the weather was perfect this year. It was in the low 80s (28C) with a slight breeze and I was in the shade. It felt magnificent to be outdoors on a day like today! This time, instead of using the PAR or the EARCHI, I used a W3EDP antenna. In fact, it was the one that I made for use at SPARC Field Day. When I got to the park, I launched a line into a tree that was located right near the spot that I had picked to operate. I attached the coax to my LDG 4:1 BALUN and hoisted it to the point where the end of the coax would be at the same level and would attach easily to the KX3. Then I picked a tree close to 84 feet away and launched a line for the other end of the W3EDP. When lifted into place, the far end of the antenna was up at the 35-40 foot level (10-11 Meters). The antenna worked beautifully and I was able to work everyone that I was able to hear. 16 of the 45 QSOs were on 40 Meters, the rest were on 20 Meters. As a matter of fact, I worked N3AQC and W3BBO on both 20 and 40 Meters and I was blown away by how loud both were on 20 Meters. I never expected PA stations to be so loud on 20 Meters. It's usually just not the case. Since the KX3 will tune up a W3EDP on all bands, I even checked out 15 and 80 Meters for a bit. There was no activity on either band that I was able to hear. I had a few visitors. One was a woman walking her dog, who was wondering if I was listening for seismic activity. Of course I told her "no" and explained what I was doing. The other was an inactive Ham who was intrigued by what was going on and perhaps, just perhaps, I rekindled a sparc (pun intended). I invited him to the next SPARC meeting. He started going on about not having equipment and not knowing CW, but I told him none of that matters. We have all kinds of experience levels and various interests at SPARC and no matter his experience level or whatever he likes to do radio-wise, he's always welcome. I stayed to the bitter end and clean up went super fast. I was home by 5:20 PM and left no sign that I was ever there. A very good day, indeed, and I already can't wait for next year! ..... is the sincerest from of flattery, then I have made a pitiful effort to flatter my friend Dave Hackett KD2FSI. Dave is one of those kind of guys where neat ideas just seem to percolate in his brain. It seems everything he dreams up and builds works really well. I admire him for his creativity and ambition, and know-how. Anyway, to get to the point, a few weekends ago, South Plainfield had a "Christmas in July" kind of street fair in the "downtown" region. The South Plainfield Amateur Radio Club set up a booth to once again get the face of Amateur Radio out there before the public. Dave came by and saw our static display and thought it could use some zing, so he brought out his backpack full of portable gear. I had seen his backpack before, but the PVC frame was new - and ingenious! Dave was able to set down the backpack without fear of it falling over, or just turning into a limp blob. Personally, I thought this was the greatest idea since sliced bread. The top handle in the back can be screwed off and the uprights store Dave's extendable whips for his various antennas. I knew right away I had to incorporate his idea into my portable backpack. Too many times I have set it on the ground, only to watch it fall over. I finally went to the local Home Depot tonight and purchased a bunch of 1/2" PVC elbows. I had a long length of 1/2" PVC pipe left over from my homebrew Buddipole building days. My configuration is nowhere as nice as Dave's, but it does serve its purpose. Currently, the pieces are just press fit together. I am going to take it apart to paint it, and when I do, I am going to shorten the uprights by about 3 inches so that the cross piece isn't so far above the top of the backpack. But so far, so good. I can place the backpack down on the floor or the ground and it stays put without toppling over. And the neat thing is that this homebrew frame doesn't interfere with the backpack straps. It's still very easy to sling over my shoulders and carry normally. The PVC is lightweight and doesn't add significant weight. For the amount of hiking that I do, it's not a problem - it's not like I'm hiking the Appalachian Trail or anything. 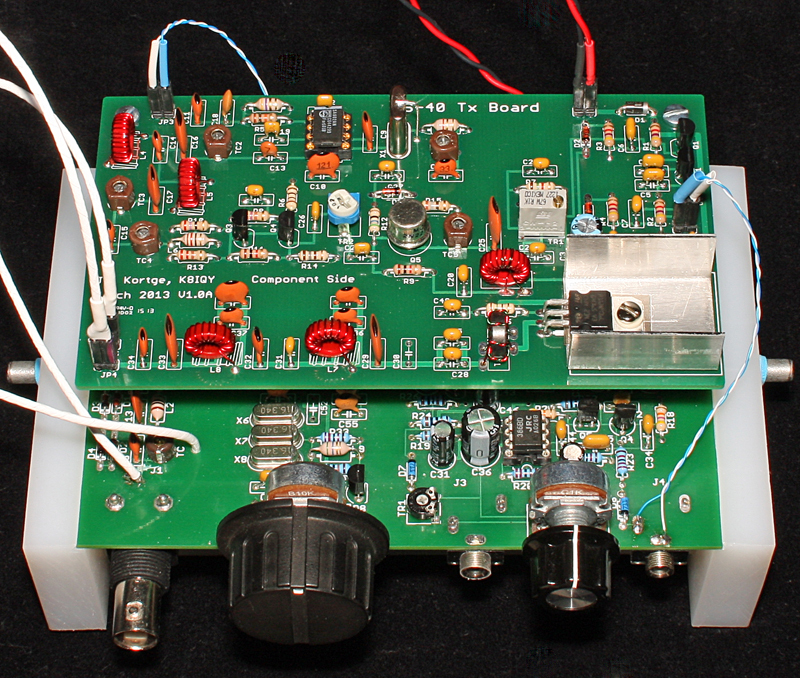 I fabricated this tonight while dealing with the 20 Meter QRP Foxhunt. The two Foxes were John K4BAI in Georgia and Dave N1IX in New Hampshire. I figured it would be a one-fer tonight, and that I would probably work John and never hear Dave. OK, so I was right about the one-fer part! I worked Dave and never heard a peep out of John the entire evening. Go figure. Every time I think I understand propagation and how the bands work they go and slap me right upside my head. I guess that's what makes Amateur Radio fun - the unpredictability. 5) What constitutes being "A Real Ham". I am sure there are many more that generate emotional and vociferous debate. When I see one of these topics brought up on an e-mail reflector, my initial reaction is "Uh-oh, this is going to get bad." And sadly, usually it does. When emotions override reason, things can get ugly and feelings can get hurt. Somehow, keyboards seem to bring out the snarkiness in people. It has become easier to type things and hit the "send" button, when you would never dare utter those same things to someone in a face to face conversation. Mea culpa, I have been guilty of that myself. However, authoring a blog (and the comments you receive) teaches you a few things along the way. You come to realize that words do indeed have consequences and that kindness, humility and gentleness are always good virtues to practice - especially when you want to leave them by the roadside and vent with a vengeance. 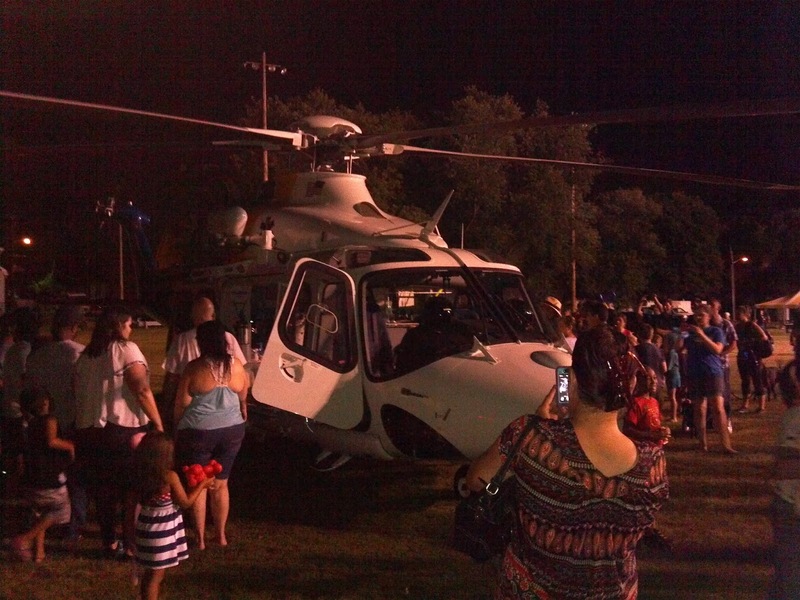 National Night Out was celebrated at Veteran's Park in South Plainfield, NJ last night. 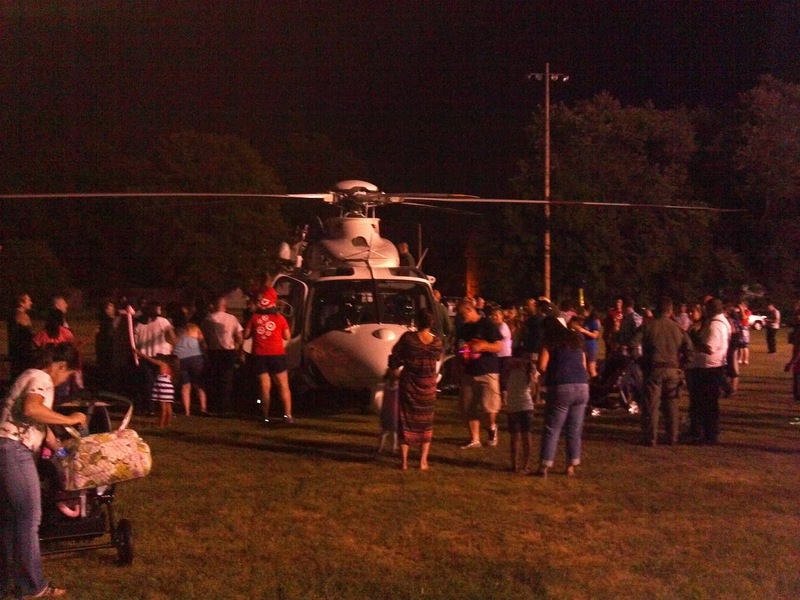 The police, fire department, rescue squad and office of emergency management were all there. And so was SPARC. We had several setups going in order to be able to demonstrate to the community the various aspects of Amateur Radio - hobby aspects in addition to emergency communications aspects. I had my KX3 going to the PAR which was held up by my Jackite pole. Dave Hackett KD2FSI had a VHF/UHF station going, as well as his JT65 setup going, and was successfully working DX stations. Dave also had his satellite antenna out for display. I had the distinct pleasure of having three QSOs while people watched. The first was with Jim WB0ZWW in Anthony, KS. Jim was using his KX3 so it was a 2X QRP KX3 QSO. But what made it special was that Jim just started using QRP power levels today - so I ended up being one of his first QRP QSOs. Conditions on 20 Meters were decent and we had a close to a 1/2 hour rag chew. The next QSO was with W8DIZ, Diz from Flying Pigs fame. Diz was using a QRPp rig, and I was his first NJ QSO. Hearing that, I lowered my power from 5 Watts to 1 Watt and got a good signal report back from Diz. Not having gone milliwatting in a long time, I lowered my power to 500 mW. Diz gave me a 449. Not bad for 1/2 Watt to an end fed antenna in a park, being lifted by a Jackite pole! My last QSO was with John K3WWP. I explained to him what we were doing in the park and how he was helping me demonstrate Amateur Radio. John surprised me by telling me that today was the anniversary of the start of his QRP QSO a Day streak, and that I was his first QSO inaugurating the beginning of his 22nd year of the streak. Wow - what an honor and a privilege. Dave's satellite antenna came in handy later on in the evening as there was a very nice pass of the ISS. It was a good elevation - about 56 degrees and it came shortly after sunset, so the space station was very bright. Dave aimed his satellite antenna and we were easily able to hear packets coming down from the ISS. That was cool! 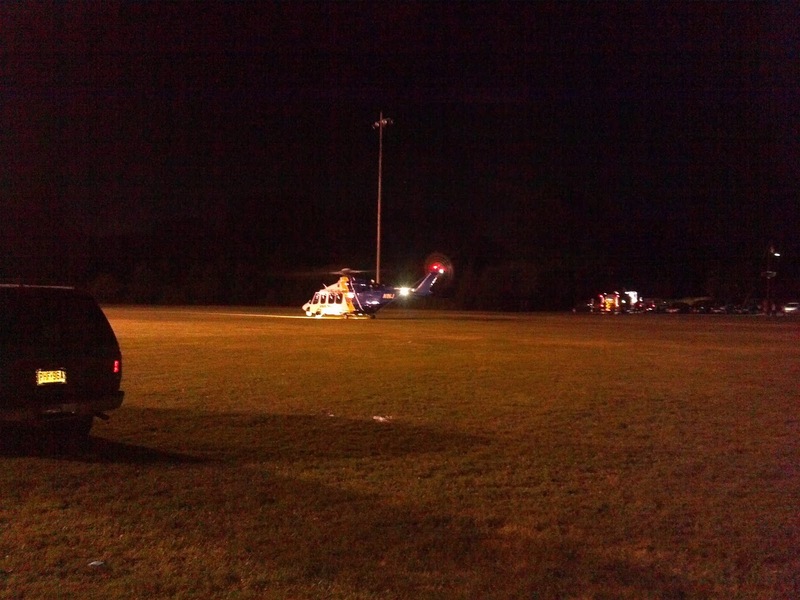 But the capper of the evening was a landing by the NJ State Police NorthStar helicopter. 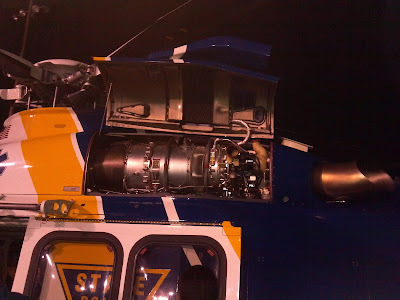 This is the helicopter used for various NJ State Police activities, but is most famous as the premier NJ Medivac Helicopter. All in all, it was a very pleasant evening, and I was proud to be able to represent the South Plainfield Amateur Radio Club once again. Labels: AmateurRadio.com, elmering, KX3, public service, SPARC, teaching. Facebook - what is it good for? A lot of Hams out there will answer that question by saying, "it's good for nothing!" It's true that there's a lot of blather and garbage that you have to go through to get to the "good stuff". But that's true with a lot of things. You have to go through a lot of rocks to find the gems, you have to pan through a lot of water and silt to find the gold, you have to dig through a lot of ...... to find the best mushrooms, and so it is with Facebook. Several of the good groups include (but are not limited to - don't want to get any one's knickers in a knot) the Field Radio group. This group is not exclusively made up of QRPers, even though that might be an assumption you would make. No, it's made up of Hams who like to take their gear outdoors and operate from somewhere other than their home shacks. Sadly, some of them don't have home shacks to operate from dues to HOAs an covenants and things of that nature. Reading their posts and looking at pictures of other portable set ups is enlightening and has given me a few ideas to ruminate on. 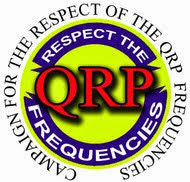 Another group more germane to QRPers is the QRP Outdoor Radio group. This group was founded by Tim Carter W3ATB, and is a very good group. Lot's of posts are shared between this group and the Field Radio group, but this one had the distinct QRP flavor to it. Pictures of portable setups in this group always include the usual QRP suspects and there's a lot of good ideas posted about antennas, field packs, etc. The last group I am going to mention in this post is truly an international one. It's a closed group (meaning you have to formally ask to join and be accepted) but is easy to join. It's called the KX3, FT-817, IC-703, QRP and Portabel (sic) group. In this group you will have to use the "translate this" option almost all the time, as 95% of the posts are in languages other than English. The good thing is the translator, while not perfect, allows you to get the gists of the posts, and it's nice to get a fresh take on operating portable from another point of view. Yeah, you can outright dismiss Facebook and social media all you want. But if you're patient and take time to dig through the layers and don't mind tossing the bad while keeping the good - you're going to find a lot of very useful information.